After we got the filters I spent 2 hours installing them but could not bleed the lines and found no fuel was getting to the engine. I gave up at 8:00PM and we had dinner at the restaurant at the marina. It rained overnight and I had to get up to put up the flybridge cover. That rain was not in the forecast. This morning I went at the fuel filters again and discovered I had put the rubber seals on incorrectly so that no fuel could get through the filters. I redid the installation, bled the lines, and at 10:30 the engine started right up. What a relief that was. However, with 63 miles to go it made for a late arrival at Fort Loudon Marina. We arrived at 6:00pm, took on 180 gallons of diesel, pumped out the holding tank, and tied to up to a transit slip an hour later. 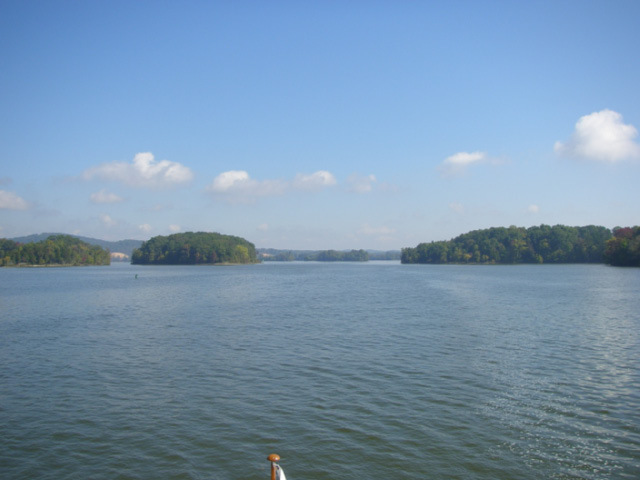 The weather was perfect today and Watts Bar Lake is gorgeous with islands, lots of rocks, deep water, wide expanses, and high hills all around. It is surely one of the prettiest on the Tennessee (see photo).